Brian Solis is known to most of our readers and his blog is one of the most influential marketing blogs in the world. He is on the forefront of social business, marketing, publishing, and culture. When his book, The End of Business as Usual , come out I asked if he could answer some questions for our readers. Brian gladly agreed. What are the key takeaways of The End of Business as Usual? Brian Solis: This book deconstructs a new era of business for you to rebuild within your organization. It’s hard work. It’s important work. The answers are at your disposal and they’re the direct result of organizations that are paving the way. Many books to date have focused on helping businesses master social media. This was really the focus of my last book Engage . There comes a point however where the opportunity that social media presents falls short of executive expectations or understanding. The truth is that you can’t make the business case just because of social media. In fact social media is just part of the story. If you align social media, mobile, gaming, deals, geolocation, et al., with business priorities and corporate objectives, you will not have to wait for negative experiences to find you, you’ll be well on your way to shaping experiences based on the delivery of real world value against real world metrics of business. This book tells the whole story of exactly how consumer behavior is changing and how to change the infrastructure of the business to adapt and ultimately lead the way. It says “you play a role in defining it”, who should read this book? Brian Solis: Good question. The word “you” was carefully chosen. Many readers are the very people that they as businesses professionals are trying to reach. As everyday people embrace new technology, their behavior evolves. How they find and share information, how they make decisions, how they influence and are influenced, requires not only understanding, but a new approach. This book tells their story and as people read along, they feel a sense of validation. The second half of the book is prescriptive. It provides instructions for how to recognize the effect of new consumerism and how to adapt as a result. Will the big faceless corporations disappear or will they still exist in the background like utilities? 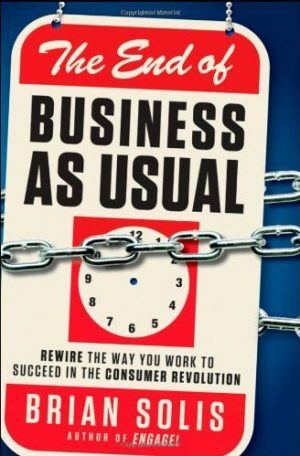 Brian Solis: The tagline of the book is “rewire the way you work to succeed in the consumer revolution.” Prior to the official release of the book, someone took the opportunity to criticize it as sensationalism, mentioning that there have been numerous consumer revolutions over the years and that this was nothing special. When I used the word revolution, I was being literal. In the book, I discuss the concept of Digital Darwinism, the evolution of consumer behavior when society and technology evolve faster than the ability to adapt. I truly believed that at some point, we would see consumers rise up against the “big faceless corporations” to demand an era of value, accountability, personalization, and a long list of other demands. And then the OCCUPY movements emerged around the world. While the book doesn’t necessarily predict OCCUPY, it does make clear that this consumer revolution would require the humanization of businesses, changing their culture and philosophy at the very core. What book should we read before this one? Brian Solis: I think back to when I wrote Engage 1 and Engage 2. In some ways, Engage is the book that you could read after The End of Business as Usual. My new book paints a clear path for the future of business. Engage connects the dots for marketing and service organizations to effectively engage with connected consumers. A big theme of the new book is also the design of meaningful and shareable experiences. I have a chapter on how Steve Jobs approached by thinking about experiences at the intersection of technology and liberal arts. Perhaps his biography could serve as a complementary read as well. Great interview! Brian knows his thing. He’s genuine. He’s passionate and he drives people. I’ve just recently lost my trust for some A-listers but Brian will always be someone I’d always admire and look up to. I think businesses can really learn a lot from him in ending traditional marketing and starting the relationship marketing instead.